The Alassio is the largest swim spa in our range and includes all the features of the Portofino but with the added benefit of a twin lounger hot tub. So if you choose, after a hard work out in the pool, you can then relax in the separate spa. 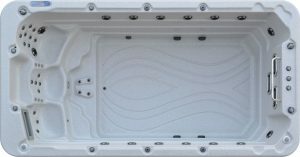 The spa/hot tub area utilises a completely separate filtration and heating system so the water in the hot tub can be maintained at a higher temperature than the pool water. Seats – 2 person lounger in spa/hot tub area plus 3 seat in pool area. Heat Pump (cost option) – ShoreHeat™ Energy Efficient Heat Pump. 1kw to 5k Heat Co-Efficiency. 4KW of FREE HEAT!